Medical malpractice occurs when a doctor, physician, or other healthcare provider causes an injury to a patient through negligence or omission. Patients or their families can file claims for damages that occurred due to the malpractice. All physician specialties risk the reality of a medical malpractice claim. However, there is a substantial variation in the likelihood of damages claims across different specialties. Additionally, the payout amount to the plaintiff in medical negligence claims differs greatly depending on the specific practice of the physician. Each year, about 8% of healthcare providers are sued for medical negligence, but some specialties face more claims than others. For example, general surgeons and obstetric surgeons are more than five times as likely to face medical malpractice claims than psychiatrists and pediatricians. Medical malpractice claims from neurosurgery lead with about 20% of all claims, followed by obstetric surgery, cardiovascular surgery, and general surgery. A doctor’s incorrect diagnosis or failure to diagnose a patient accounts for the highest amount of malpractice allegations, according to information from the National Practitioner Data Bank. Who Is Least Likely To Be Sued? Family general practice, pediatrics, and psychiatry are the specialties that are least likely to be sued for medical malpractice. Psychiatrists have the lowest risk, with only 2.6% facing claims. Why Are Certain Specialties Being Sued More Than Others? The majority of medical malpractice lawsuits are due to the failure to diagnose a disease or ailment, or from a patient who suffered abnormal injuries under a doctor’s care. Less common reasons include failure to properly document medical files, medication errors, performing an operation without informed consent, or failure to follow safety procedures. 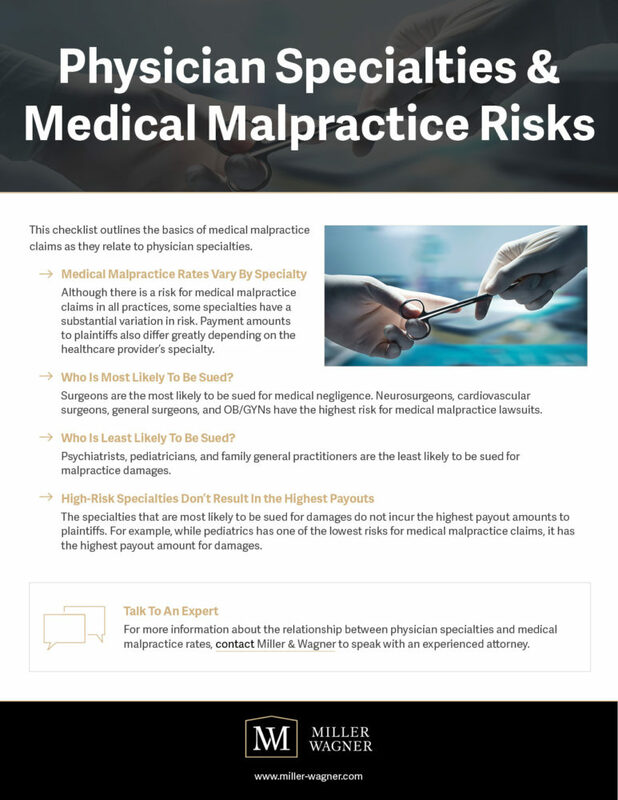 Each of these forms of malpractice can have a more severe impact on surgical or obstetric patients than other specialties, leading to a higher overall number of claims. According to a 2015 Medscape Malpractice report, the majority of specialists who face lawsuits have office-based solo practices. Conversely, most of the doctors from specialties least likely to be sued run outpatient clinics. Claims that are filed for inpatient treatment are more likely to be brought due to surgical errors, whereas claims filed for outpatient specialties are often related to misdiagnosis. Although some specialties are more likely to face medical malpractice lawsuits, they do not always mean higher payment amounts to the plaintiffs. For example, family general practice has one of the lowest risks for medical malpractice claims by specialty, but falls in the middle of the spectrum for payout amounts. Furthermore, the pediatrics specialty has the highest payment amounts to plaintiffs, but is one of the least likely to experience a medical malpractice claim. According to the American Medical Association, most physicians, including those in low-risk specialties, will face at least one medical malpractice claim over the course of their career. Oregon is ranked 11th for claims exceeding $1,000,000 with almost 8% of claims in the state exceeding that amount. To learn more about the relationship between physician specialties and medical malpractice claims, contact Miller & Wagner today.